It doesn’t take a miracle. It takes a plan. Start With a Free Session! Whether you’re a student, a parent, a professional, a senior citizen, or an elite athlete (or all of the above! 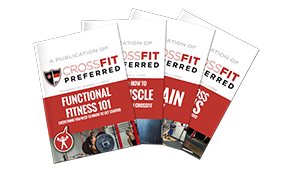 ), CrossFit Preferred’s experienced coaches and constantly evolving programming are perfect to get in the best shape of your life! If competition is your game, you’ll love our CrossFit Endurance Training. We train SEALFIT Kokoro athletes. We even do level testing. Only 14 people in 5 years have passed our Level 4 test. Are you next? We’re a great group of athletes and coaches that are very inviting and friendly, and we want you on our team. No big egos here. Just real people like you who strive to continually improve! Don’t wait for it. Work for it. Conveniently located at 3244 E. Guadalupe Road in Gilbert, our 3,000-square-foot box is the backdrop to your best transformation yet. We’ve got all the amazing CrossFit tools you’ll need to unleash your inner athlete. Don't be shy! This gym is welcoming for all ages and abilities. Coaches help you work towards your goals. I was very much a beginner. So far I've lost 30 pounds, and I'm in the best shape of my life. I love CrossFit because it's not about maintaining - it's about always improving. So beginner or elite athlete - this gym is for you. Me, my husband and 2 teenage kids all work out at CrossFit Preferred, and we absolutely love it! It doesn't matter what level you are at, there's workouts for everyone! I wouldn't go anywhere else! !